AUSTIN Motor Company Bagnall 0-6-0ST No. 401 Thomas Burt MP (2994/1950), known to generations as Vulcan, is on course for a return to traffic later this year at the North Tyneside Steam Railway/Stephenson Railway Museum. 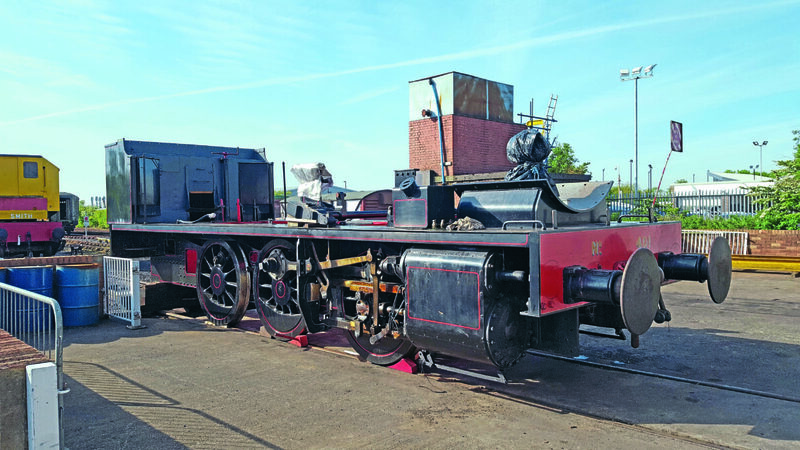 On May 17, the Bagnall’s overhauled frames were reunited with the wheelsets at Middle Engine Lane, the wheels having been re-tyred at the South Devon Railway last year. All bearings have been overhauled and the springs fitted, and following the re-wheeling the valve gear is almost fully reassembled. Once this has been completed work will turn to fitting the brake gear. The loco’s boiler returned from overhaul at the North Norfolk Railway on January 17, and the hope is it will be returned to the frames during the summer. Railway spokesman Robin Gibson told The RM: “We’re fairly close to the boiler being lifted in place, hopefully within six to eight weeks, then a mad rush to assemble all the top bits.